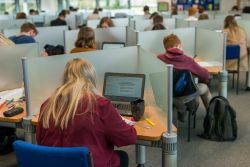 There are two main study areas in College where you can work when you are not in your lessons: Ashurst Learning Resource Centre (LRC) and Hopkins Study Area. These areas are divided into quiet and silent zones, so that you can choose the best working atmosphere for you. Our students regularly tell us that they like being able to get on with their homework during their study periods and that they focus better in our study areas than at home. They feel more motivated to work when surrounded by others doing the same. We also have equipment and resources to support your work at college. We have hundreds of PCs and laptops available on a drop-in basis, loaded with the software that you need for your studies. We have a large collection of online and physical books, journals, magazines, films and documentaries which are chosen to support the curriculum as well as provide you with the resources you need for reading around your subjects and carrying out extra research. The study areas are wifi-enabled so you can bring in your own mobile devices and access college work or print using the college printers. Ashurst LRC is open during the evenings and college holidays (these vary depending on the time of year). Students should check the LRC intranet for up-to-date opening times.